The discourse of and around Learning, Design & Technology fascinates me. I am specifically referring to words that are sometimes taken as a given, globally understood and accepted when discussing education and technology. These conversations often remind me of a scene from the movie Rush Hour. I am interested shared meanings and understandings words that may seem very common. I am currently exploring this through two projects. The first project probes the understanding of what it means to be “learner centered”. Dr. Michael Grant and I presented a portion of this research at the AECT conference in 2013, and will soon collect data in at least two other countries. In the second project, I am collaborating with Dr Shu-Hsiang (Ava) Chen on trying to understand what we mean, globally, when we say “Open Educational Resources”. I am not so sure that when we say the same words, we really mean the same things. Sometimes we pretend to know a word/term/concept but are only using it as an ID to enter the gate of our own conception of “learned society”. The works of Jean Lave and Etienne Wenger (1991) gives examples on the importance need and desire to belong to a community of practice. There is also a rich body of literature around groupthink and the length that some go to in order to be part of something. To one extent or another every adult can reflect on or recall a situation in his or her youth, when s/he wanted to be part of the cool kids group or when others wanted to be part of the in group. Even in the case of the isolated, there are those who admire said isolation. In academia I believe this manifest itself in the use or misuse of words; perhaps because we are not sure what they mean or we do not have a good contextual understanding or an appreciation of the historical origin. 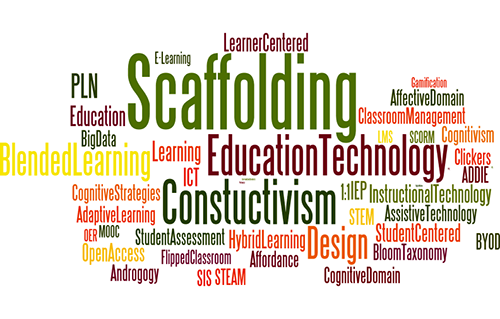 An example of what I’m referring to from my own experience is the word “scaffolding,” commonly used when discussing technology and education. This was a tough word for me to grasp at first because of the way it was introduced. The first teacher who introduced it to me explained it using the metaphor of a scaffold to build skyscrapers that enables people to get higher as they go. I recall that the building of a skyscraper and other examples she used were difficult for me to grasp because they required cultural references that I did not have. It was not until a few years later that I was writing an article with my advisor Dr. Simon Hoooper on InfoVis and Scaffolding that I was able to dig further. I read more closely Roy Pea’s (2004) commentary on the social and technological dimensions of scaffolding. I was then able to commit to this concept and understand it beyond simply memorizing the definition. Pea explained it in terms of mother-infant encounters that had nothing to do with computer mediation. The example used in his article was something that most people globally can understand regardless of cultural origin. The challenge (not difficulty) that I am now cognizant of is offering examples which my students can relate to, teasing out their own metaphors to facilitate concepts that may be new or difficult and to always promote a search for shared meaning especially before embarking on a discussion. Pea, R. D. (2004). 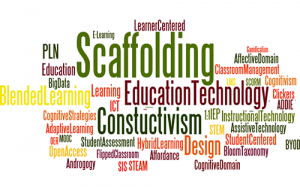 The social and technological dimensions of scaffolding and related theoretical concepts for learning, education, and human activity. The journal of the learning sciences, 13(3), 423-451.